Whether its true or not, this is the word: Alama promised N77m to a juju guy to bring him back home. The guy visited the Stomach in London and was promptly given his advance. The witchdoc told him to dress as a woman etc. From the time he arrived at Heathrow he vanished, magically appearing in Port Harcourt the next morning (presumably out of a fog of ectoplasm)..
A spiritualist, one Dr. Panyan Tuesday, based in Sagbama in the riverine area of the state, whose popularity is said to spread beyond the boundaries of Bayelsa because of his ability to see beyond the ordinary eyes, was said to have been approached on October 20 by four persons to help in solving the governor’s problem, and the parties agreed on a fee of N77million with which to carry out the necessary sacrifice. It was alleged that a deposit of N2 million to Tuesday was agreed upon for work to commence pending the payment of the balance while another gift of N40,000 as well as promise of handsome rewards immediately their benefactor is let off the hook, ostensibly by November 11 were reportedly made. Now people can believe even more in the mumbo jumbo. The statement, inter alia, read: “I am Dr. Panyan Tuesday, a native of Ayama, residing at Sagbama. I am a spiritualist. I was at home on 20 October, 2005, when the following persons (names withheld) came to my compound in Sagbama. 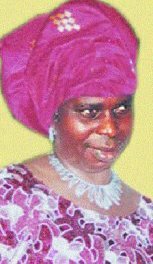 “They said I should do something to see that Chief DSP Alamieyseigha is released and back home as from that day to 11November, 2005. “They promised to come back later that day to give me two million Naira to start the work which was actually given to me and I did the work in their presence. The work involved libation with the said amount of money being thrown into the river to appease the marine spirits. Sorry, I meant to say VANGUARD not Guardian. I had just read the post o guardian before this. Whoops. Holy cow. I taught African Juju doesnt pass the borders of their territory. But come to think of it, did he arrive through any airport? I'm not sure about the Heathrow airport version, the reports I have read say that he left London via the Eurostar at Waterloo, then travelled from Paris to Cameroun and then got on a boat for the remainder of the journey. I haven't travelled on Eurostar recently so the checks may be more stringent but in my experience the border controls when leaving London via Eurostar are hardly difficult to fool.